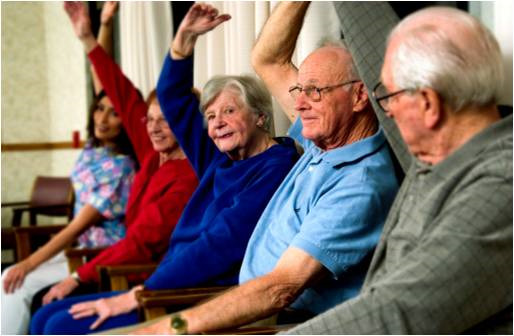 In parts I and II of this blog series, I discussed why it’s important to cultivate a robust health and fitness program for residents in AL and memory-care environments and how to tap into your existing personnel to make that happen. In this final blog of the series, I’m going to cover a few additional resources for enhancing your fitness program. 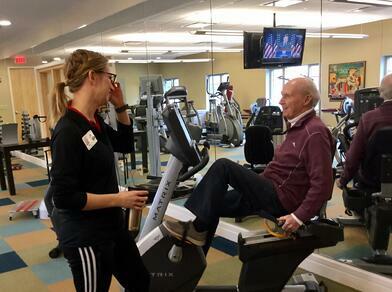 Consider how you can have a more inclusive environment in your IL fitness amenities: Can you establish criteria or resident support tools to invite AL or memory-care residents to use the existing exercise equipment in the fitness center or partake in group exercise classes with IL residents? Develop a fitness space: Whether it is sectioning off a small corner of an existing activity or lounge space or building out an entire room for fitness equipment, having a dedicated fitness space or studio can be a great option for residents of all ability levels. Dedicate a variety of exercise equipment options: It’s time to put down the pool noodles and the beach balls. There are a number of small fitness equipment pieces on the market that can create new challenges and variety in group exercise classes. Consider qualified staff: The demand for quality fitness offerings for older adults has steadily increased in the past decade. Fortunately, there also more qualified fitness staff on the market who have experience catering to the unique needs of older adults. Working with a staffing partner like NIFS or hiring your own fitness professional to support your residents’ health and fitness needs even in a part-time capacity can be a significant enhancement to your program. Through the course of this blog series, I’ve highlighted a variety of opportunities to enhance your fitness offerings for AL and memory-care residents. While having qualified fitness staff can be a difference maker, there is quite a bit that existing activities staff can do to improve exercise offerings. With that being said, you already have a full plate of responsibilities to serve your residents and pausing to develop a strategy for doing fitness better might be a challenge. If you’re ready to improve your fitness program for residents in assisted living and memory care environments, find out more about how we can help you. During my morning commute a few months ago, I switched on the radio and caught the tail end of a brief NPR story about doctors not communicating to their patients when they are diagnosed with Alzheimer’s. Because I am surrounded by this disease in the workplace and have experienced it first-hand in my family, I was quick to become empathetic and my heart sank into my stomach. It just seemed so unfair and, well, wrong. The next day, I decided to dig a little more deeply and find the article in writing. Maybe I missed some important details at the beginning of the story. Maybe the twist was that these patients were being diagnosed but simply forgot after they walked out of the doctor’s office doors, because, after all, they do have memory loss and dementia. Unfortunately, that was not the case. According to this specific study, an alarmingly low number of patients with Alzheimer’s (only 45%) claimed that they were given this diagnosis by their doctor. When the study looked past the patient’s input, still only 53% of family members or caretakers reported being aware of the diagnosis. The reasoning behind this sits among a variety of excuses, ranging from the doctor having limited time in each appointment to the doctor simply feeling uncomfortable. Is It Acceptable to Withhold the Diagnosis? Are these legitimate excuses? Is it ethically acceptable to withhold information that is unknowingly being written down in your medical records just to save one or both parties from feeling uncomfortable? Goes for a walk or bicycle ride without telling anyone and gets lost. Accidentally leaves the gas burner on all day while home alone. Needs help but forgets how to dial the phone. Leaves the water running in the bathtub, does not realize it, and goes to bed. Gets in a pool alone and forgets how to use their legs, loses footing, and goes under. Some of these examples may seem extreme, but they are actually scenarios that either myself or someone I know has personally witnessed. So many dangerous situations can be avoided if family or close friends are aware of the diagnosis. And though there is no cure, doctors are finding medications that can help slow down the disease process, and researchers are finding more and more ways for people with Alzheimer’s to gain a better quality of life through means such as music, aquatics, memory care, and more. I often see family members or caretakers get frustrated, and even angry, with people who are forgetful. When we are able to have a medical diagnosis, can realize that it is truly a disease and out of the person’s control, and can view the whole picture, we are opening a door to having more compassion and understanding for the situation a person with Alzheimer’s is facing. When creating senior wellness programs, we often focus on the physical realm of wellness. I would like to take some time to talk about emotional wellness. 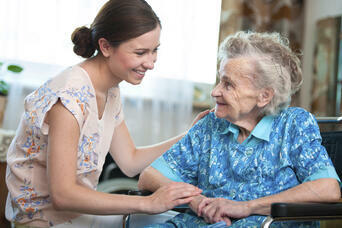 In particular, I want to get into the emotional wellness of our residents with various forms of dementia. All too often when someone begins to feel the effects of some form of cognitive loss, they begin to pull away. At first it is out of embarrassment over not being able to recall a friend’s name immediately or the name of a common object, or the frustration as they lose the concept of time and place. Imagine if you had the knowledge that you were no longer able to follow a conversation with a group of people and be able to equally contribute to that conversation. Wouldn’t that lead you to draw away from your friends and family to save yourself from such an embarrassment? All our youthful years we identify ourselves by what we do or what we know. I’m an athlete, a lawyer, a doctor, an engineer, and so on and so on. Wouldn’t this also lead you to be depressed if you could no longer identify yourself? 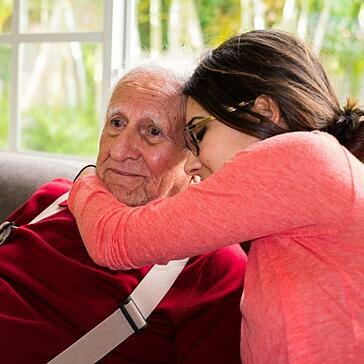 What if we as the caregivers could do more than take care of someone with dementia? Do more than shower and dress and prop them up somewhere. Those of us in wellness tend not to be the ones to deal with the hygiene portion of an individual’s care, so how can we contribute to their daily lives? The easiest and best way is time and attention. Depending on the stage of disease, there are many things that we can do to let our residents know they are still loved. It is easy to say, “Yeah, but I don’t have time. I teach classes and run programs and work with people individually and there is just not enough time in a day.” There is good news. It does not take a lot of time. Programs can be created to include spouses, friends and family members, or volunteers to help share the responsibility of time. These programs can be built to be held in short increments of time. The most important thing with any of these programs is to just remember to be with your residents. Not shuffle them from place to place or activity to activity. Take the time to truly be with them. Let them tell you a story; ask questions about their interests. Don’t try to control the conversation. Let it go wherever it may, just as you do when catching up with a good friend. Music time: Sing-alongs, classical music, or music of their time. Music is the universal language understood all over the world and is the best trick up our sleeve.Story time: This is not time to read a story to your residents. This is time to listen to your residents’ stories. Pay no mind if that story switches tracks; just be there to listen to that story and contribute to a conversation that may come out of it. Current events breaks: Try to focus on some happy current events. The most important thing to remember is to live in the moment, because that is all someone with dementia has: a series of moments. I encourage anyone who potentially will be spending time with someone with dementia to either read the book or see the movie Still Alice by Lisa Genova. It is a profound story that will open your world to an amazingly deep understanding of an individual’s perspective of the need to be needed. Just like any exercise program, there is a long list of health benefits that come with exercising. In fact, exercise not only improves physical health, but cognitive health as well. The Alzheimer’s Association widely accepts that, “Physical exercise is essential for maintaining good blood flow to the brain as well as to encourage new brain cells. It also can significantly reduce the risk of heart attack, stroke and diabetes, and improve oxygen consumption”. Though memory impairments affect the body’s cognitive heath, it’s important to perform cognitive and physical activities to improve brain function. The body also needs strength and endurance to perform its activities of daily senior living such as eating, dressing, and getting around your home. With this in mind, we began offering a special class to meet the unique needs of the memory-care residents at our community. We made it our goal to incorporate exercise as a means of fall prevention and overall improvement of physical and mental health. Having taught group exercise for quite some time, I thought this would be an easy transition. I reached out to my colleagues for advice on specific exercise recommendations for older adults with memory impairments and quickly mapped out an exercise class format. Boy was I surprised when I taught the class for the first time! The normal exercise cuing of “Lift your right leg up. That’s 1, 2, now 3….” just didn’t cut it. Some of the individuals followed, but most of the residents looked at me with confused faces. One resident even said, “You know you are a really bad dancer!”. So, over the next couple months, with much trial, error and research I developed a new class called “Moving Minds”. The new class incorporates seated exercises that are both engaging and effective. We always begin with a short warm-up with seated marching and a game. The game is as simple as passing around a beach ball, bean bag toss, or some form of bowling. This gets the residents moving and their brain focused for the main exercises. Our main exercises include low-impact joint movement and stretching. We use equipment such as pool noodles, balloons and bouncy balls to add a little fun. The residents love doing the exercises with the noodles and are always playful with each other. I always encourage the residents to count with me out loud as we go through the exercises. After 10-15 minutes of our main exercises we wrap up with another game. We also engage in conversation while doing the exercises where I ask the date, day of week, and various other questions. Some are more attentive than others, but they always have something interesting to say. One of my most enjoyable residents, yells “10, big fat hen!” every time we count to 10. Overall, the residents’ health is continuing to improve and I have noticed small gains in cognitive ability. Sometimes the residents remember my name and I can tell they are getting used to their Moving Minds routine. The Center for Brain Health states, “Physical exercise may be one of the most beneficial and cost-effective therapies widely available to everyone to elevate memory performance”. Moving Minds may not look like a typical exercise class-in fact, I still have residents who comment on my “bad dancing” or make animal noises the entire time we exercise. However, the truth lies in their many giggles and big smiles as they leave the class. Each week I’m reminded how great it is to work with this population.